Stay tuned for upcoming events for Filmact Workshop in near future. Filmact Workshop is a hands-on interactive training on Film Making, Acting and Script Writing. 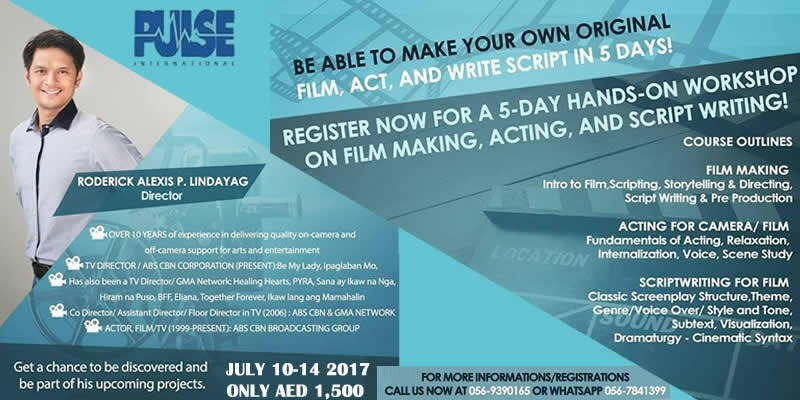 Roderick Alexis P. Lindayag, famous director will conduct Filmact Workshop 2017, a 5-day training workshop from 10 to 14 July 2017 at Roda Al Murooj Rotana in Dubai, UAE. Pulse International Businessmen Services is organizing this session for those who are interested in Direction, Acting and Writing. Participants will also get a chance of being discovered and becoming part of upcoming projects of Roderick Lindayag. Learn to Make your own Original Film, how to Act, and Write your own Original Script in just 5 Days. Course modules are Film Making, Acting for Camera / Film and Script Writing for Film. Course outlines cover various aspects of Direction, Pre Production, Storytelling, Daramaturgy, Filmography and more. Roderick Alexis P. Lindayag is a director for TV in the Philippines. He has over 10 years of experience in on-camera and off-camera support for Arts and Entertainment. He is working as TV Director for Be My Lady on ABS-CBN. He has previously directed Ipagalaban Mo on ABS-CBN Corporation. He has also done direction on GMA Network for Healing Hearts, My BFF, Pyra: Ang Babaeng Apoy, Kakambal ni Eliana, Sana Ay Ikaw Na Nga, Together Forever and Ikaw Lang ang Mamahalin. Terms & Conditions : All sales are final no refund or cancellation Organizer reserved entry right. Best Viewed at 1024 x 768 pixels and above. This Page loaded in 0.06561 seconds on Fri, Apr 19, 2019 (07:22).